This may sound obvious, but, if you want to sew, build, solder, weave, or even tie your shoes, it helps to understand the materials with which you’re working. The outreaches and field trips we conducted over the past year as part of the Buhl Foundation’s One Northside grant dealt with this very thing. Through building and sketching, students at local schools built invaluable knowledge and also learned a thing or two about structural integrity. Essentially, materials exploration is about the why and not just the how. Something stiff is unlikely to make a knot. Something opaque forms a more effective barrier than something clear. And so on. As adults, we take these facts for granted. But kids don’t. As in so many other activities, I always find it invigorating to see someone learning something new. Many students used words like “flexible” and understood their implications for perhaps the first time. We visited each school twice and each school visited us twice in turn. On the first visit, we stuck to the basics, introducing concepts with their opposites: flexible vs. stiff, hard vs. soft, hollow vs. solid and so on. We also discussed each material and its properties. Some of these materials provide material for rich discussion: plastic can be flexible or stiff, for example, and it can be clear or opaque. Students then got to explore and talk about materials. 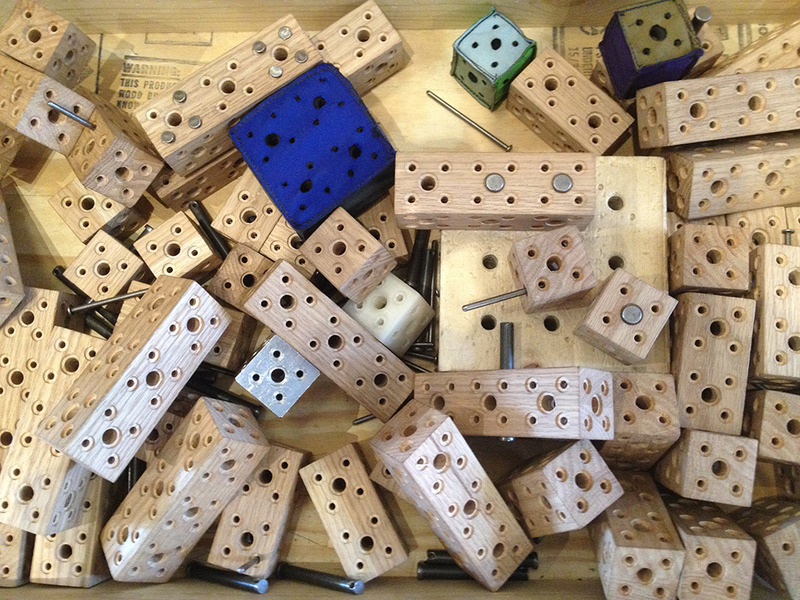 In some early sessions, our teaching artists introduced basic attachment using nuts and bolts. Later sessions focused much more on attachment. As students progressed and we introduced brackets, the scale of the structures the kids built increased pretty dramatically. One decision which was made based on prior experiences with Build-It was that each session should end with ample time to sketch structures. The sketches revealed a surprising amount about what the students had learned and their individual personalities—some kids put a great amount of work into capturing texture, while others wrote numerous labels that described their structures’ materials’ color, shape, size and more. Each school and each individual group had its own rewards and challenges. Time was, however, by far the most serious constraint. Had we had unlimited time and unlimited materials, I have no doubt that many groups would have built skyscrapers. Teamwork was occasionally difficult, but with some encouragement teams of students often reached compromises or used their materials in innovative ways, turning pieces of felt into window shades or building moving doors, ramps and staircases with their panels and brackets. The simplest and most essential element of Build It—nuts and bolts—provide a good analogy for the overall experience of the One Northside workshops. By themselves, they are pieces of metal. They may fit places, but their functionality becomes much clearer when they’re put together to bind diverse materials and build something greater than themselves. Thank you to the “One Northside for Every Student” project from Buhl, which aims to give all students in our neighborhood a chance to experience and explore the cultural offerings around them!